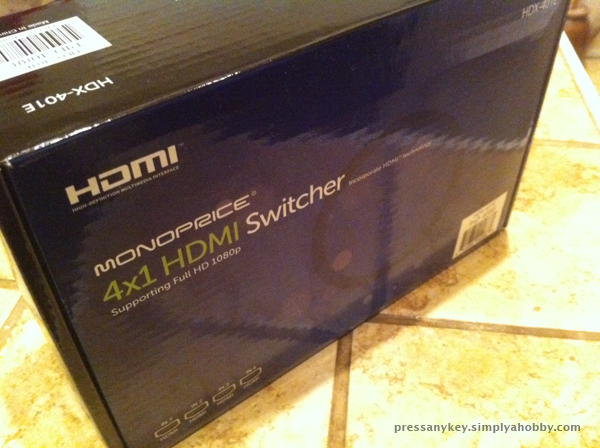 A couple of months ago, after my 4×2 switch died, I purchased a Monoprice 4×1 HDMI Switch (HDX-401E) with the intention of using it temporarily, until the 4×2 switch had been repaired. Instead of just buying another 4×2 switch to begin with, I purchased this one hoping to save some money (it cost about $25). The switch did not work as planned. It seemed to be of poorer quality than the 4×2 switch. Specifically, it was lacking in proper HDCP support, or at least it wasn’t as good as the 4×2 switch. On more than one occasion I received HDCP related warnings when attempting to use the AppleTV via the 4×1 switch. This wasn’t a problem caused by the HDMI extender – I saw the same problem in the living room when the output was connected directly to a TV. Based on my experience, I wouldn’t recommend this product. I think this is the first time I purchased a product from Monoprice that did not work as expected.